Formerly known as Plexihost, the company changed its name to HostMantis in 2010. Since then, this web hosting services provider has been playing with the big boys of the web hosting industry. HostMantis brands itself as a customer-centered web hosting solution, providing clients with the best web hosting rates, features, and high grade customer support. 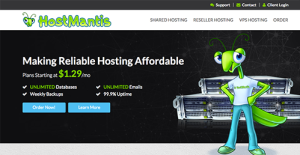 Unlike most web hosting companies today, HostMantis owns all of its servers, giving them total control as well as plenty of room to develop and improve their services so they can power their clients’ sites with speed and ease. Its top tier data centers are located in North America and Europe and are high-speed Cisco cores, with built-in redundancy with a focus on stability and performance. HostMantis offers an uptime guarantee of 99.9% of the time during any given 12-month period. This guarantee covers network uptime, server uptime, web server and service uptime. To achieve reliable hosting service, HostMantis employs a host of world class server equipment, network devices, and other systems critical to the operations of its facilities. All servers and data centers feature redundant power, HVAC, and fire detection systems and are monitored 24/7. How Much Does HostMantis Cost? HostMantis includes the latest version of cPanel with all their packages, providing users with a user-friendly control panel to manage their hosting account features and tools and apply changes to their website without the expertise of a professional programmer or IT expert. Every company has its own characteristics, and may call for a specific solution that will be fit for their business size, type of customers and employees and even specific industry they support. We advise you don't count on getting a perfect service that will be suitable for every business no matter what their background is. It may be a good idea to read a few HostMantis reviews first and even then you should pay attention to what the hosting service is intended to do for your company and your workers. Do you need an easy and straightforward hosting with just elementary functions? Will you really make use of the advanced tools needed by pros and big enterprises? Are there any particular tools that are especially beneficial for the industry you work in? If you ask yourself these questions it will be much easier to locate a reliable service that will fit your budget. We realize that when you make a decision to buy Hosting Services it’s important not only to see how experts evaluate it in their reviews, but also to find out if the real people and companies that buy it are actually satisfied with the product. That’s why we’ve created our behavior-based Customer Satisfaction Algorithm™ that gathers customer reviews, comments and HostMantis reviews across a wide range of social media sites. The data is then presented in an easy to digest form showing how many people had positive and negative experience with HostMantis. With that information at hand you should be equipped to make an informed buying decision that you won’t regret. HostMantis provides a variety of customer support channels for their subscribers, which include 24/7 phone support, ticketing system, knowledgebase, and community forums. Clients can also check the status of their server and network with the Server Status feature. Video tutorials are also available as well as other digital downloads. What are HostMantis pricing details? HostMantis accepts all major credit cards (VISA, Mastercard, Discover, and American Express), PayPal, 2CheckOut, Bitcoin, and Payza. Yes. HostMantis includes cPanel web management in all hosting packages. Service credits are given to compensate for the downtime. To qualify for credits, clients are required to submit a request together with supporting documents to validate the downtime incident. Yes. HostMantis allows the use of WordPress as a website platform. Users need to install WordPress via the Softaculous installer app found in cPanel. There are no indications that HostMantis is a viable option for eCommerce websites. They do offer SSL certificates from Comodo, which are made available for a fee. HostMantis offers unlimited email accounts and huge bandwidth with their packages. Do they let you easily create a website with no HTML or coding experience? All HostMantis plans come with the RVSiteBuilder, a user-friendly website builder that provides users with tools and templates to create a professional-looking website from scratch in just 5 minutes. The latest RVSiteBuilder now offers a new WYSIWYG editor interface, enhanced functionalities, and more business-ready templates that are built to be mobile-responsive. No, HostMantis does not offer a free domain with their hosting options. HostMantis offers Windows and Linux hosting solutions. HostMantis' networks are powered by high-speed Cisco cores, with built-in redundancy to ensure stability and performance. Facilities are equipped with redundant power, HVAC, and fire detection systems plus topnotch security systems to ensure that they remain operational and shielded from any intrusion or breach. On-site technicians are monitoring all facilities to maintain maximum uptime and reliability. If you need more information about HostMantis or you simply have a question let us know what you need and we’ll forward your request directly to the vendor.